Burning bacon candles? Billboards that translate bat calls? Pod cars at airports? 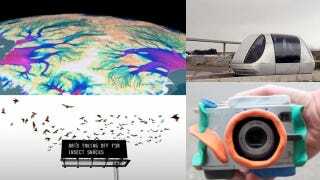 We have a whole lot of funky design ideas, as well as apps, hacks for digital cameras and more this week on TreeHugger. Modern Personal Rapid Transit, or PRT or podcars, are finally being put to use in London's Heathrow Airport. Are you about to step on an endangered species? This app lets you know. There's a lot you can do with Sugru, but this one takes the cake — build a camera that is kid proof (or drunk photowalk-proof). Last week we thought a kid figured out a brilliant solution for solar power. This week, not so much. NASA has released a map of Antarctica's complete ice flow. It is the first of its kind to show the speed and direction of ice flow on the continent, with glaciers flowing from the center out to the coast. It will either make you less creeped out by bats… or even more creeped out. Australia's army is testing out wearable solar panels that could make soldiers far more mobile without giving up access to plenty of electricity. It's The End Of The World As We Know It. What are you going to do? Your flashlight batteries are dead. Hell, your candle wax is even running low. All you have left to eat is bacon. Well, at least there are worse ways to die. But wait ... A burned-out candle. Bacon leftovers. What? Behold the bacon candle. It's time to consider the less tangible benefits of installing solar on your home.